Photo copyrighted by Arlene Ibarra. Used with permission. Redheads have to be careful what colors we wear, as things can quickly get clashy. In a million years, I would a) never have expected to wear a red dress, b) never have expected to wear THIS red dress, c) never ever have thought I would post a photo of myself on the Internet in this red dress. Here’s the story about how this photo came to be, and what it represents. The photo was taken by the talented Arlene Ibarra at my friend Channing’s birthday party. The party, a surprise, was themed on the television show Revenge. The show revolves around a party in the Hamptons where the women are in red cocktail dresses and the men in white shirts. Channing loves the show, and had mentioned off-handedly to his wife that it would make a cool theme for a party. We receive the invite for the party with the instructions for attire. Crap. Not only do I NOT have a red cocktail dress, I don’t wear red. Period. It clashes with my hair and I have never worn it. But Channing is a close friend and I assume (without knowing the story) that his wife has a good reason for the theme. I ask around. No one I know has a red cocktail dress. Screw it. I decide to wear black. I bought this dress and a pair of cheap Spanx. The whole outfit cost me just under twenty bucks (dress, shoes, faux-Spanx). Why was this dress such a big deal, besides the color? Let’s see… I was just about to turn 51. I hadn’t worn a halter top since the late 70s. It was really form-fitting. It didn’t seem like me. 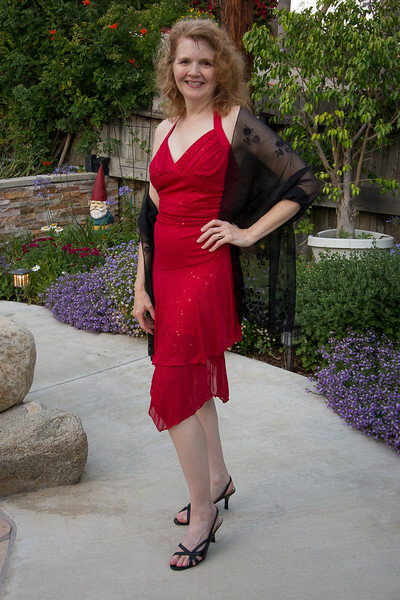 Since turning 50 I have been trying to push myself in new directions, embrace who I am inside and out, and I decided that this crazy sparkly dress was a symbol of that inner growth. But I had to own it. So I did my hair, put on party makeup, and walked out of the bedroom. The Husband didn’t know quite what to make of it, as it was so “not me.” A bit of fear crept inside. Was I going to look ridiculous? Did I look like I was wearing a costume? What if no one else was in a red cocktail dress? It was too late to change, and I really had nothing else to wear, so we headed out. The reaction from my guy friends at the party gave me my answer. They usually see me at dog park in a baseball cap and jeans, and they were extremely complimentary. I asked Arlene to take this photo of me specifically so I could share it with you. I’m not posting this as an ego trip, although I think I looked pretty good, especially for 51. I’m telling you this because that night, I embraced my beauty. I owned who I am. I broke out of my comfort zone and got some nice compliments for it. Yes, I have some wrinkles and yes my body’s not perfect. But that doesn’t mean I can’t throw on some Spanx, glam up for a night, and enjoy the way that feels. And that red dress? It’s still in the closet. You never know when I might need it. Make that 51 going on 31. You looked awesome! Um…50 0r 20, it doesn’t matter! You rocked that dress! I’m not 50 yet and I could not have pulled that dress off! And I think your hair looked so nice with it…maybe red is a color you can wear sometimes. Hi Stephanie! Just wanted to officially jump in with a BIG BRAVO. Kudos to you for rockin’ the red dress! If you hadn’t told me, I would never believe you were in your 50s. With or without the dress. You look fantastic, and redheads definitely should wear red! The clash adds to the pazzazz! I LOVE your story!!! Being a red head & creature of comfort, I feel your apprehension! I too was going to do a black dress and bling out with red accessories and I am so glad I didn’t! (http://trudatkat.blogspot.com/2012/08/dirty-girls-can-wear-red-too.html) Rock that red dress girl!!! you look great! It looks like the dress and accessories were made just for you! Lovely! Hubba hubba, Stephanie! Work that runway! LOL Laura. Thanks. It makes me appreciate how effortless those movie stars make it look. Hubba hubba – what a glamour girl. If you had just posted the photo without the writing I would have never questioned your choice of that gorgeous outfit on you. Oh, Kelly, thank you so much. If you find the right thrift store, and are pressed for time, sometimes the thrift goddesses smile upon you. Rock on indeed! Yay Stephanie! You look gorgeous. Congrats for getting your glam on. Thanks Dianne. You continue to inspire me, months after your workshop. I love your courage & I love you… What a beauty! Thanks sweetie. Borrow the dress any time. You would look fab in it! Forget about looking good for 51 – you look good, period. Go you! Rockin’ the red! What a cute post, Stephanie! You look mahvelous, and I would NEVER have thought for a minute that you were 50. You have such a youthful air about you and you look so much younger! Thanks Alice! All those years of enforced sunscreen are paying off. Thank you Susan. You would look great in this dress!